Below is a step by step guidelines on how to use the Ohio business search tool. 2. 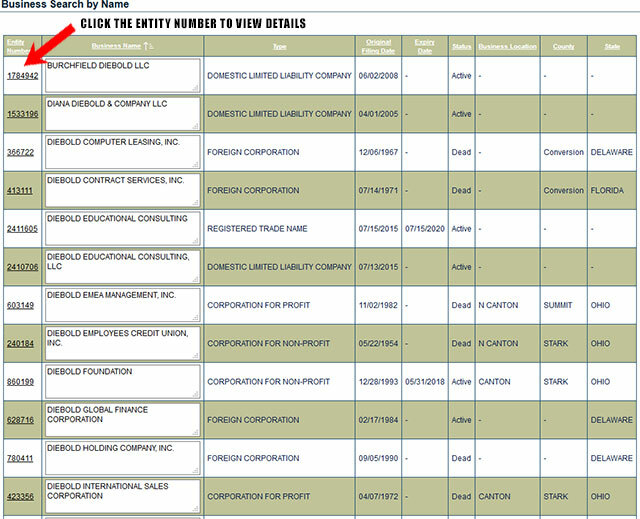 The business search form allows you to search by the name of the business. There are other options on the left side menu that can help narrow down your search including searching by the exact business name, search by business number, agent etc. But for this example we will use the default search option and search by name. For the "Business Name" text field type in "Diebold" and then click the "Search" button as illustrated in the screenshot below. 3. Once you click the "Search" button a list of business entities that match your search criteria will appear on the page and include information for each business found including their entity number, status, type, location, filing date, expiry, agent name etc. The results page would appear similar to the screenshot shown below. 4. Once you click the entity number for the business you want to see, the system will now show you the details for that business entity, as shown in the screenshot below. The Secretary of State of Ohio is an elected constitutional office within the state of Ohio. The term of office of the Ohio Secretary of State is four years (with a two-term limit). 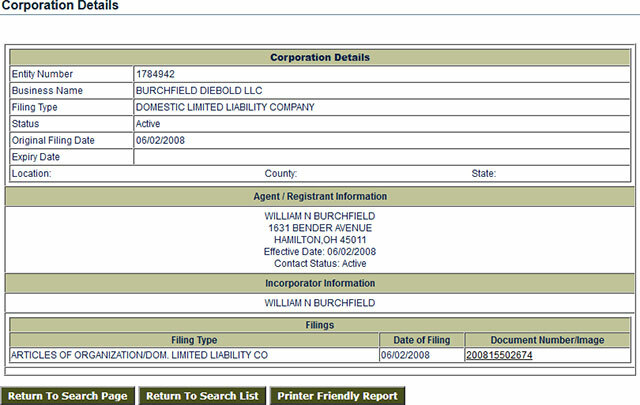 Presently, the Secretary of State of Ohio is Jon A. Husted. The Ohio Secretary of State is responsible for a broad set of responsibilities. He administers public rules and oversees the public affairs of the state. He is also the chief of the Elections Division of the state. 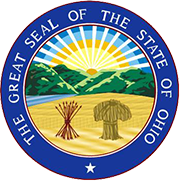 The Secretary of State of Ohio is the person in charge for registering and authorizing entities to open business in the state.